The Selle Royal Torx saddle is a comfy way in to commuting and leisure cycling. When I first took up cycling as an adult, one of my worst experiences was lying at the side of the road, 10km into a ride, bottom in agony, refusing to get back on as the saddle of my nice new bike was an instrument of torture which caused bruises which lasted a week. I only managed to get home by creating a cushion from a fleece jacket, and didn't go out again until I'd purchased a comfy saddle. Now if your cycling oeuvre is 100km before breakfast, up hill and down dale, then this is not the saddle for you. In fact if you've been regularly cycling for any length of time, then the size and padding of the Selle Royal Torx will likely impede your progress. But this saddle isn't intended for you, dedicated road.cc reader. It's for the newbie, arse tender as a baby's bottom, with sit bones which are unaccustomed to even the 'it takes a while then it's bliss' of a Brooks. If you, or your mum/partner/friend is just taking up cycling as a commuting or leisure activity, the Torx might just keep them going over the tricky first few months as their body gets used to the new pressure points. Selle Royal describe the Torx as being suitable for a 'relaxed' riding position. For this read 90 degrees upright, as in on a Dutch bike or cruiser. When viewed in this context, the Torx does its job well. It supports the entire bottom on a thick layer of gel padding backed up by wide covered springs underneath. The saddle is fairly waterproof and has a click out cover under the seat that hides a light or saddle bag attachment. I found the Torx seemed to push me forwards onto the nose, and looking at it sideways on, it does have a noticable dip in the middle like a hammock. This served to reinforce a very upright riding position as leaning forward even a little threw pressure onto my pubic bone and squashed the soft tissues. 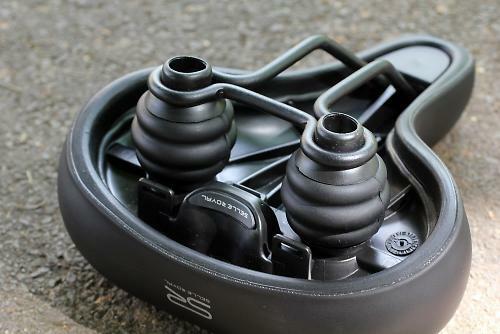 The Torx is 275 mm long and 250 wide at its widest point, with a chunky nose which would stymie any attempt at speed, but that is not what the saddle is built for. At 1002g, it is bloody heavy, even in comparison to similar models, but it's not going to be noticeable on the heavy framed bike for which it is intended. In terms of construction, I think that the Torx will survive the nuclear holocaust with the cockroaches due to its bomb-like construction. 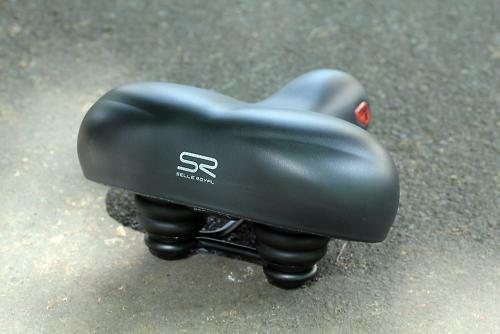 One of the sturdiest Selle Royal saddles, suited to the Relaxed riding position and tested to support up to 150 Kg. This saddle is also one of our widest; it features a system of wide gauge elastomers and a surface layer of highly durable Strengtex. Further support is provided by the Royalgel™ padding, which guarantees the highest level of comfort by reducing pressure peaks up to 40%. The RVL sealing technology is included for added water resistance. Royal Vacuum Light is a Selle Royal technology that allows the saddle to be 100% sealed and 20% lighter than ordinary saddles of the same category. A patented clip system positioned at the rear of the saddle for easy attachment of a light or saddle bag. Safe, silent and permanently non-deformable, an elastomer can absorb even the severest and most unexpected shocks, because it works vertically and horizontally. Mostly, I forgot about it when riding, which says it all for the aims of this saddle. No signs of wear even after several weeks of use. Not even light compared to others in its class. Apart from the hammock-like dip, it was a barely there feeling for slow commuting and round town cycling. Did you enjoy using the product? It did the job. Would you recommend the product to a friend? Yes, if their situation suited it. Looks like a boris bike saddle which I never thought were that comfortable.